A new public opinion survey released this week shows Chicago residents overwhelmingly agree arts and culture attract tourists, improve the livability of Chicago, make significant contributions to the economy, and prepare students for future success. Chicagoans also participate in the arts at a higher level than national rates. The survey of 800 Chicago residents is being released by Arts Alliance Illinois, as part of Accelerate Culture, a citywide initiative to advocate for, promote, and monitor the implementation of the Chicago Cultural Plan’s top line priorities. The results of the public survey confirm that Chicagoans overwhelmingly support and place a high value on culture and the arts. At the same time, access to these experiences is not universal and awareness of neighborhood-based cultural activities can be increased across the city. “The Cultural Plan and the survey results demonstrate the widespread support by Chicagoans for culture and the arts in Chicago no matter where they live in the city. 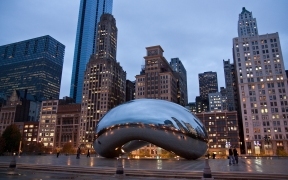 Arts and culture play an enormous role in Chicago’s success and are the reason the city is vibrant and such a desirable place to live and visit,” said Michael Dorf, who chairs Accelerate Culture and directed the development of Chicago’s first Cultural Plan in 1987.